NEW P A I N T I N G S ! 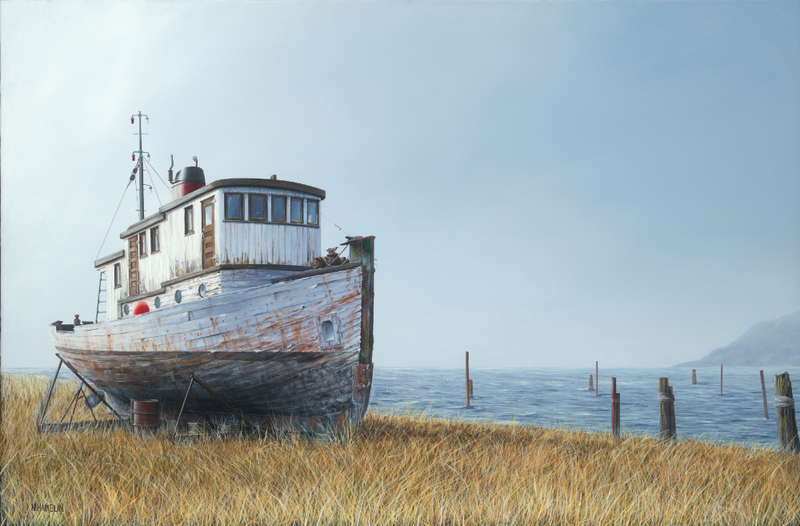 One of my favourite subjects to paint are older tugboats. Loaded full of character and built to work hard, speed and sleek lines be damned. Most of these tugboats are as unique in their overall appearance as we are and take on a personality all their own. Talk to anyone who spent their life working on the water and they speak of these boats using the same terms used to describe any living breathing object with free will. This individual personality of these subjects is what I try to capture with my artwork. Most of us have owned cars that have a temperament all their own that we learn how to live with like you would a roommate or significant other. I’m convinced our old van only gets to the top of most hills as a result of Cheri’s encouragement and cheers. I have a 1961 Land Rover that I have owned for 16 years and feels like a cherished friend that I have shared many adventures with. It’s terribly anthropomorphic but I am sure most of you know exactly what I mean!A couple of years ago my dad and I took a road trip to Oregon as there was an International Marine Artwork show that I had a painting accepted in. We spent a few days touring the coast looking for interesting subjects with these two paintings having been captured from that trip. 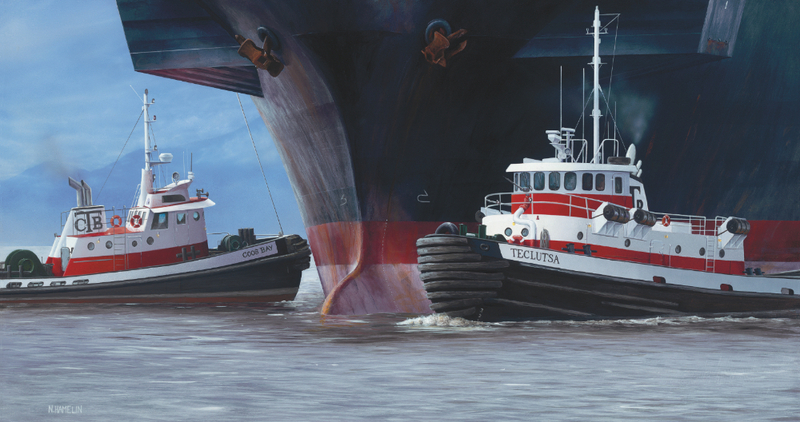 The first painting titled ‘Coos Bay Tugs’ was inspired while watching these two beautiful tugs positioning this ship in the harbour. There were actually three tugs, but the third was out of scene working at the stern of the ship. I was immediately drawn in by the size of the ship and when composing the scene I wanted to capture the ship in a fashion that emphasised this. By having the ships bow fill the canvas it really makes the ship feel massive and sets up a nice dark backdrop to capture the tugboat behind. The sun was breaking through the clouds and really lit up these tugs. The contrast between the dark shadows of the ship and bright colours on the tugs highlighted this nicely. Although highly detailed, I feel that it is the simplicity of this scene that makes the painting work. From across the room it is immediately recognizable and captures a feeling of movement by the small bow wave and puff of exhaust created as the tug cuts across the bow of the ship to help his mate push from the other side. It is a lengthy process to paint these tugboats as there is so much equipment on deck, but the hard work is always worth it. On our return home we stopped for the night in Port Angeles. Along the waterfront, we were able to sneak down into the shipyard where we stumbled up on this gorgeous old retired boat. It was in that perfect state that I try to find where it has weathered to a condition full of interesting textures with a myriad of colours, but not so far that you feel bad for its current state. What I love is the rich character that is seen in boats like these. If one could, the stories that this ship may be able to tell about the life it has lived full of adventure and hard work, would be fantastic to listen too. Akin to listening to the fascinating stories told by your grandparents about the hardships experienced in their lifetime. This scene captures that feeling perfectly for me. I wanted this painting to clearly be about this old boat and nothing else. That solitary feeling was emphasised by leaving no trace of other life to confound this. The feeling of the hazy sky with the rich and warm golden grass set up a nice and unique backdrop for this boat. I left the ship off to the far left side of the canvas to help capture the feeling of loneliness and to emphasis the vast ocean behind. For me, the biggest enjoyment when painting images like this is the chance to capture so many different textures, whether it be flaking paint, rusty metal or wind blown grass. Titled ‘Hard Life’ this reflects the boat being out of water and ‘on the hard’ as the saying goes, as well as the obvious hard life she must have led. On my next trip through Port Angeles, I will be sure to return and see how this old boat is doing. I wonder what her future holds for her. To the right person with a ton of enthusiasm she may just feel the waves splash on her hull once again. Ladner Village Market, it is the last one for the season!! Lots to eat, Lots to see and Lots of great stuff to take home.